IB Biology - Today we started by regrouping into sets of 5. This is because we'll be pursuing our 2nd semester topics as small groups and we'll need to diversify in order to get the work done. 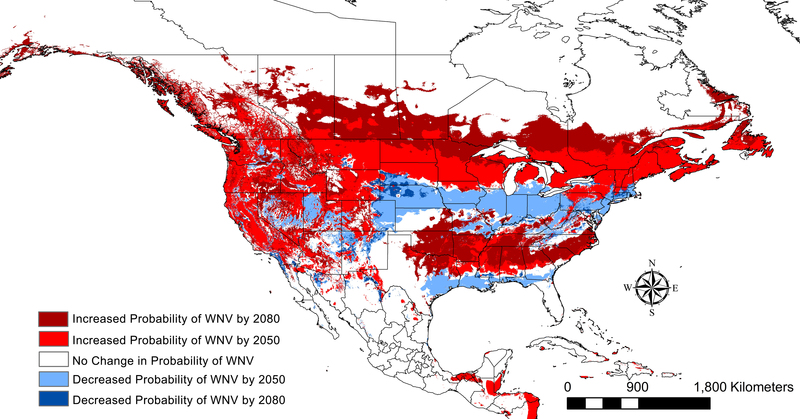 We next looked at the following projection map: https://climatereporters.files.wordpress.com/2015/03/257145_west_nile_virus_risk.jpg Then, after really getting deep into the many unanswered questions about this map, we realized that there is so much more we need to know. Tomorrow we will pick up this "battle", but in the meantime I need you to read the following article (https://www.sciencedaily.com/releases/2017/10/171012122835.htm) and to do three things: 1) Identify what the causal factors for the transmission of the various diseases are? 2) Where is their evidence to connect these? 3) What is a model and how are they created? Just jot down your ideas, but be ready to discuss it deeply. 2) Describe the difference between knowing and thinking WITHOUT using the examples from the short video. Please write your example on a HALF SHEET of paper. 3) Please place your name (Last and then first) on the top of the half sheet. 4) Lastly, I want you to go to the very bottom of the half sheet and to write the topic listed below that you understand The LEAST. Your topics are: Macromolecules, Water, Enzymes, Cell structure, Cell Membranes, Cell respiration, or Photosynthesis. This will be turned in first think tomorrow! ...I almost forgot. You need to have at least a 70 page notebook by Friday! IB Biology - Today we began by starting the process of breaking down our roles as researchers in understanding our future. This meant that one person in each group had a commitment to either: Vector borne disease, food/water borne disease, social policy, geophysical aspects, or human health impact. You also selected a disease that you could trace through this process to determine if climate change might effect it as well. Yet, before we can do any of that we need to define what an archaea, bacteria, or a virus actually is. Your job, which you started in class was to determine the similarities and differences between these three entities. You work should come in by tomorrow and should show some real understanding. DO NOT just list qualities of each! Since we are doing this in terms of disease spread you should be looking at how they are pathogenic! Check out this cool opportunity IB students: The Scripps’ High School Exploration Program (HSEP) is now accepting student applications. This is a 2018 summer internship opportunity at various Scripps’ hospital locations in San Diego County. Please forward to any of your health pathway students who have a 2.5 GPA or higher and who may be interested in applying. Click here for more information about HSEP. Honors Biology - Today you got a lab group, a new seat, and a recount of what we know at this point in the year! I also introduced you to the kids of tasks we should be able to do by the end of the year. Meaning we need to not only KNOW our biology, but also be able to THINK about how this biology applies to human health. You took some notes that should be able to help guide us, but in the end we realized that we really need to know 4 big ideas to help these patients. 1) We need to know how vital signs are important indicators to health, 2) How does growth and development occur, 3) How does heredity impact our health, and 4) How does our environment impact us? We will start with growth and development tomorrow, but tonight I need you to take a sheet of paper, but NOT the one you took notes on today, and to find normal vital signs that you can use in the future. Yes, you can make it an electronic document and cut and paste tables on it, but you will need to print it up, and you will need to include BMI, Blood Pressure, Heart Rate (Pulse), Normal Body Temperature Range, and Respiration Rate for kids through adults. IB Biology - Today we started to get some real direction on interpreting Monday's predictive map. We started by looking at the entities we compared last night. As we dug deeper we started to find that man of the differences are stark and others, not so much. This began to make us discuss the idea of time scale and how related these things are to each other, or in other words CLASSIFY them. So this is our first step towards our goal of understanding the big picture of disease. Tonight I want you to do the following: 1) Find a phylogenic tree (or cladogram) that shows your virus or bacteria's relationship to another type of bacteria or virus that we have heard of. 2) Find out more about how your virus or bacteria operates as far as your expertise (geophysical, vectors, social policy, etc. goes. and 3) Start the process of understanding the material in chapter 5.3 and 5.4 on classification. Here are the things you should address: When and why we use the binomial system of taxonomy? ​How many domains are there and how do we sub-classify organisms? Why do we reclassify organisms at times? What is an example? Complete the DBQ on 262. Do the activity on 267. How does all of this classification connect to ancestry? What is the difference between analogous and homologous traits? Give us an example of each. What are "Molecular clocks" when it come to ancestry and how do they work? How is microRNA helpful in determining ancestry? Complete the DBQ on 273. Honors Biology - So today we went over the vital signs that you researched last night. We discussed what these numbers mean and that they are meant to give us a guide to better health. After practicing on yourselves I want you to go to your family and explain to them what we are researching and maybe even share some of your new known facts that pertain to the numbers. You will want to collect gender, age, height, weight, pulse, and respiration rates. If you have the equipment at home you can also do blood pressure and temperature. Once you have collected this data, I want you to check the patient's BMI, pulse, and respiration and decide if they are currently within healthy ranges. Be sure to inform your patient of your findings and then record your information on a separate sheet. This separate sheet should also have you and your family's vitals and an assessment for each person. The assessment is an evaluation of the vital signs. Because we keep medical information confidential on patients please do not use actual family member names. Your name, of course, must be on there. IB Biology - Today we had two main focuses. The first was a startling look at the current flu epidemic. It was amazing to see how quickly this illness is progressing! you can follow up on these results at: http://www.sandiegocounty.gov/content/dam/sdc/hhsa/programs/phs/documents/InfluenzaWatch.pdf . Then we looked briefly at some of the phylogenic trees that you produced on your virus/protist. Lastly we looked at an exemplar IA in preparation for yours! Yes, this is a class assignment, so regardless of whether you are an IB diploma student or not you will need to complete one. The first step to completing one is to find a topic and research question. Tonight I want you to use the following links to find three potential topics and a possible research question for each topic. This will be turned in tomorrrow so that I can make add ideas. LINKS: http://www.nuffieldfoundation.org/practical-biology/topics​ and https://www.mrgscience.com/ib-biology-internal-assessment.html The sample IA can be found on the bottom of this week's blog. Tonight I need you to take the other side of the paper you took notes on today and to create a Claim, Evidence, and Reasoning on what this video is actually showing us. Please use complete sentences and be thorough in each part of the CER. The claim is typically a sentences or two, and the evidence is usually a list of things you observed (with time signatures). It's the reasoning that usually takes a paragraph or two and explains why the evidence makes you think your claim is correct. Oh, and the animal experimentation guidelines in a document attached at the bottom of this week's blog. Lastly, remember that on Wednesday you will be taking a Socrative quiz on chapters 5.3 and 5.4. Be sure you come on Tuesday prepared to discuss your questions that were assigned earlier this week. Honors Biology - ​Today we did two things. The first was to set up our notebooks. You should have received a stack of ten sheets (which can be found on "Online Resources page of this site) and placed them into the appropriate spots in the notebook along with the work that you have done up to this point. After getting organized we then looked at the brain intensive work you did last night. We examined your claims and looked for the supporting evidence. Some of you even did size comparisons to see which of the major themes is more likely. Then we developed what we would like to know more about and you isolated the following questions on the left hand side of the entry titled, "Microscopic Mitosis." Please come prepared with answers about these question on Tuesday. Why do these things duplicate? What is the reason? Are these cells in our body or single celled organisms? When/How does this process happen whatever it is? What other organelles are involved in this process? By the way, great first week together. Your ability to take risks in class is fantastic!